Belize NMS: Showery activity and gusty winds continue over the country with an area of low pressure just off the coast of Belize. 24-hour forecast: Cloudy with some showers and thunderstorms, along with a few periods of rain over most areas, and especially over southern parts of the country tonight. General Outlook: Mostly cloudy along with a few showers and thunderstorms mostly over the south and coast Wednesday morning and again during the night; and mostly over northern and inland areas during the day. Today E-SE 15-25 kts Rough 5-8 ft SOME HEAVY SHOWERS AND THUNDERSTORMS. Tonight E-SE 15-25 kts Rough 5-8 ft SOME HEAVY SHOWERS AND THUNDERSTORMS, ESPECIALLY OVER THE SOUTH. Tomorrow E 15-25 kts Moderate-Rough 4-7 ft A FEW SHOWERS AND THUNDERSTORMS. Outlook E 15-25 kts Moderate-Rough 4-7 ft WEDNESDAY NIGHT:- A FEW SHOWERS AND THUNDERSTORMS, ESPECIALLY OVER THE SOUTH. A tropical wave over the central Caribbean is forecast to become diffuse and ill-defined by Wed morning. Two other tropical waves east of the Caribbean are forecast to merge and move into the eastern Caribbean by Wed afternoon. A broad area of low pressure, a Central American Gyre, is centered over Honduras near 16N5W. Scattered moderate to strong convection is occurring over Central America and the Gulf of Honduras. This system is expected to move west-northwest toward Belize. The probability of tropical cyclone development during the next is moderate, but the potential for heavy rainfall, flash flooding and mudslides over areas of mountainous terrain is high. Refer to your local meteorological service for specific information on this potentially dangerous weather pattern. 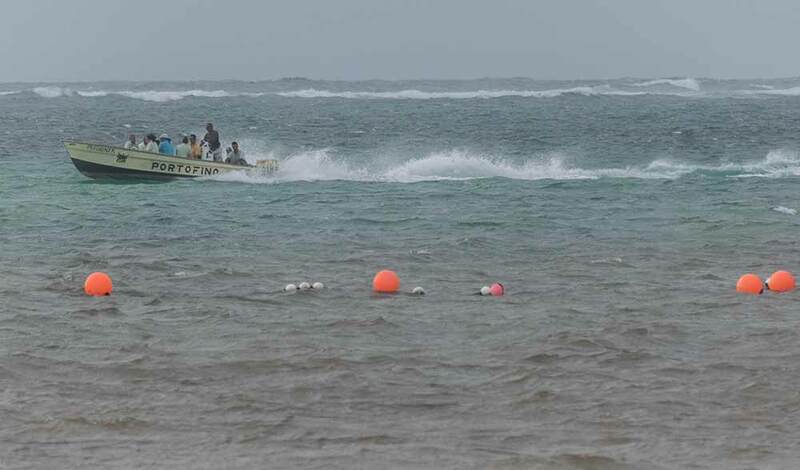 On Ambergris Caye this morning the sea is rough and wind from the East-SE at 15 mph. It's gonna be a wet ride to work today. 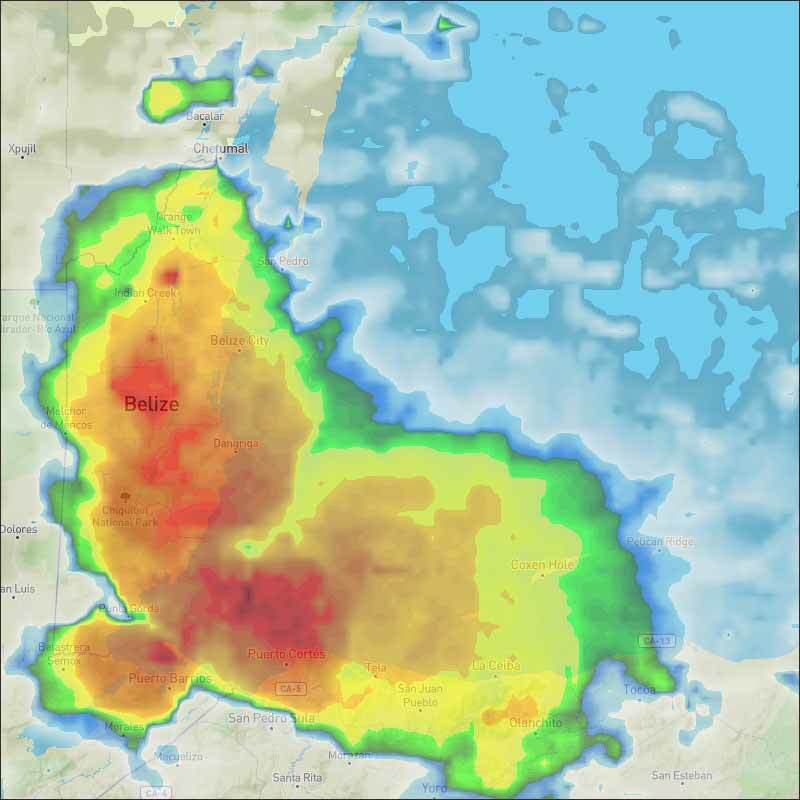 Much of that cloud and the ITCZ activity in it has now moved from Nicaragua, up to over Honduras and Belize and now moving into southern Mexico and Guatamala, it has been identified as INVEST 94L which has brought a lot of rain last night and in parts of Belize continuing today. Usually the cause of rain over us is normal cloud getting a bit high as the day warms up and clashing with upper air, but this present is ITCZ activity, that is vertical air movements, causing internal swellups, which have the potential of developing into tropical storms, if they get large enough and start to rotate. This has not. Looks as if the worse of the rain is passing, a little still in central and north, but more to come for the south, but most areas staying heavy cloud much of the day, some clearing by this afternoon. The Cloud and Rain picture. 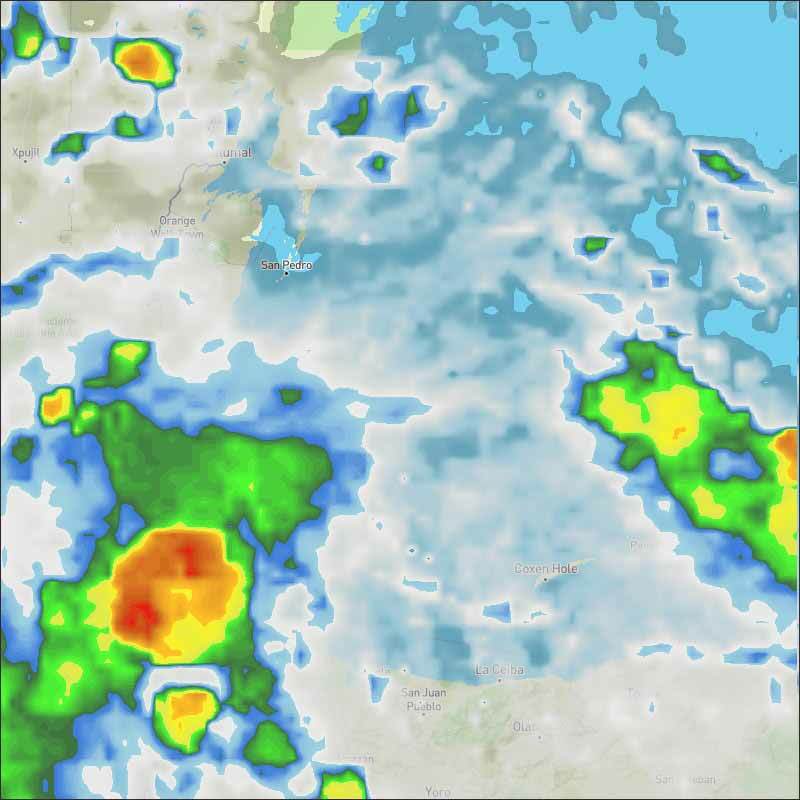 This same low pressure area with continuing ITCZ swellups is continuing to cause patches of rain, some heavy and most of Belize under heavy cloud.